Accumulating evidence suggests cortical circuits may contribute to control of human locomotion. Here, noninvasive electroencephalography (EEG) recorded from able-bodied volunteers during a novel treadmill walking paradigm was used to assess neural correlates of walking. A systematic processing method, including a recently developed subspace reconstruction algorithm, reduced movement-related EEG artifact prior to independent component analysis and dipole source localization. We quantified cortical activity while participants tracked slow and fast target speeds across two treadmill conditions: an active mode that adjusted belt speed based on user movements and a passive mode reflecting a typical treadmill. Our results reveal frequency specific, multi-focal task related changes in cortical oscillations elicited by active walking. Low γ band power, localized to the prefrontal and posterior parietal cortices, was significantly increased during double support and early swing phases, critical points in the gait cycle since the active controller adjusted speed based on pelvis position and swing foot velocity. 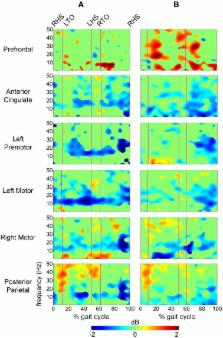 These phasic γ band synchronizations provide evidence that prefrontal and posterior parietal networks, previously implicated in visuo-spatial and somotosensory integration, are engaged to enhance lower limb control during gait. Sustained μ and β band desynchronization within sensorimotor cortex, a neural correlate for movement, was observed during walking thereby validating our methods for isolating cortical activity. Our results also demonstrate the utility of EEG recorded during locomotion for probing the multi-regional cortical networks which underpin its execution. For example, the cortical network engagement elicited by the active treadmill suggests that it may enhance neuroplasticity for more effective motor training. EEGLAB: an open source toolbox for analysis of single-trial EEG dynamics including independent component analysis. We have developed a toolbox and graphic user interface, EEGLAB, running under the crossplatform MATLAB environment (The Mathworks, Inc.) for processing collections of single-trial and/or averaged EEG data of any number of channels. Available functions include EEG data, channel and event information importing, data visualization (scrolling, scalp map and dipole model plotting, plus multi-trial ERP-image plots), preprocessing (including artifact rejection, filtering, epoch selection, and averaging), independent component analysis (ICA) and time/frequency decompositions including channel and component cross-coherence supported by bootstrap statistical methods based on data resampling. EEGLAB functions are organized into three layers. Top-layer functions allow users to interact with the data through the graphic interface without needing to use MATLAB syntax. Menu options allow users to tune the behavior of EEGLAB to available memory. Middle-layer functions allow users to customize data processing using command history and interactive 'pop' functions. Experienced MATLAB users can use EEGLAB data structures and stand-alone signal processing functions to write custom and/or batch analysis scripts. Extensive function help and tutorial information are included. A 'plug-in' facility allows easy incorporation of new EEG modules into the main menu. EEGLAB is freely available (http://www.sccn.ucsd.edu/eeglab/) under the GNU public license for noncommercial use and open source development, together with sample data, user tutorial and extensive documentation. Control of goal-directed and stimulus-driven attention in the brain. We review evidence for partially segregated networks of brain areas that carry out different attentional functions. One system, which includes parts of the intraparietal cortex and superior frontal cortex, is involved in preparing and applying goal-directed (top-down) selection for stimuli and responses. This system is also modulated by the detection of stimuli. The other system, which includes the temporoparietal cortex and inferior frontal cortex, and is largely lateralized to the right hemisphere, is not involved in top-down selection. Instead, this system is specialized for the detection of behaviourally relevant stimuli, particularly when they are salient or unexpected. This ventral frontoparietal network works as a 'circuit breaker' for the dorsal system, directing attention to salient events. Both attentional systems interact during normal vision, and both are disrupted in unilateral spatial neglect. An integrative theory of prefrontal cortex function. Journal ID (publisher-id): Front. Hum. Neurosci. Copyright statement: Copyright © 2015 Bulea, Kim, Damiano, Stanley and Park. Electromyographic patterns of tibialis posterior and related muscles when walking at different speeds. Gait deviations associated with post-stroke hemiparesis: improvement during treadmill walking using weight support, speed, support stiffness, and handrail hold.